Coleslaw is pretty much always a staple at any summer picnic or BBQ. And if you are a Weight Watcher, most of those coleslaw recipes can have some pretty scary stats which can use up a lot of your allotted Daily Points Allowance. But try making this slimmed down version instead, and you’ll satisfy your craving for crisp and creamy coleslaw, but you’ll only be sacrificing 2 Points for each 1 cup serving. 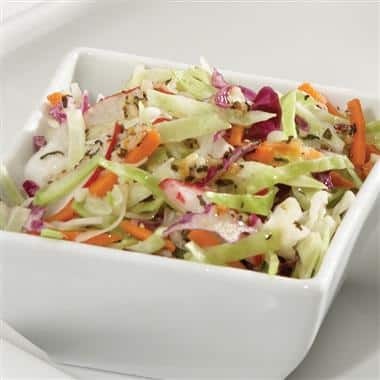 Combining some traditional coleslaw ingredients with some not so traditional ones gives this tasty, low calorie side dish recipe a wonderful flavor, while still fulfilling the sweet and creamy texture you’d expect. So the next time you want a great idea for a Weight Watchers Side Dish Recipe, give this Creamy Coleslaw with Red Onion and Apple a try. Don’t feel guilty about serving coleslaw at your next Weight Watchers friendly summer meal…instead try this healthier version that has just 2 Points per serving. It makes a wonderful and light no cook summer recipe that’s easy and satisfying! In a large bowl, whisk together the yogurt, mayonnaise, mustard, vinegar, celery salt, pepper and sugar. Add in the cabbage, onion, carrot and apple, and toss well to coat. Cover and place in refrigerator for a minimum of 30 minutes to allow flavors to blend and marinate. Toss again before serving. Her recipe calls for 1 teaspoon of celery salt…not 1 tablespoon. If 1 teaspoon is too much then need to adjust…. Found this recipe on pinterest and was SO excited to try it… as I was mixing it up, I wondered, like other commenters, if 1 T of celery salt was a misprint, but did it anyway… Don’t get me wrong, we are celery salt LOVERS in this house… but… Really wishing I had read the comments before making!! I think this recipe would be great if it had a tsp vs tbsp in it… From what I can taste thru the overpowering celery salt attack its the right consistency and creaminess and I will probably attempt it again, just modified.. Thanks for sharing all of your recipes, it can be hard to find ww recipes that aren’t bland and boring! Is the 1 tbsp for celery salt a misprint?? Made this tonight and wow, it’s very powerful and not very good. I had such high hopes! No, that’s the correct amount, but you can always make it with a lot less celery salt, if you’d like. Sorry it didn’t turn out so good :(. I made this, but you should add wayyy less celery salt. It is almost inedible with a full tbsp of the celery salt.